But despite the omnipresence of sheep and livestock smells, muddy roads and cloudy skies, Xinaliq is actually quite a charming place. As I was researching my trip to Azerbaijan, the name “Xinaliq” kept coming up in forums and articles. There wasn’t much information on how to get there, or what to do while there. I couldn’t even figure out how to pronounce the town’s name. And this sense of mystery, on top of rave reviews from locals in Baku, was why I chose to go to Xinaliq. I went to Xinaliq in search of something, but I wasn’t sure exactly what that something was. After spending two quick weeks in Iran and a few days in Baku, I felt interested but exhausted by the pace of the cities I visited. I was yearning for some fresh air, spectacular views, and a taste of something a bit more remote. Xinaliq definitely gave me what I was looking for. This day trip to Xinaliq from Baku was easily my favorite adventure during my time in Azerbaijan. 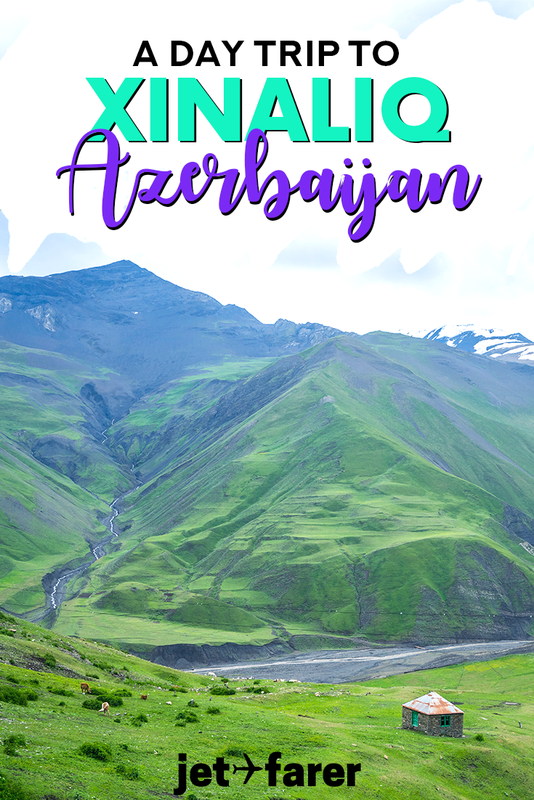 Scroll on to read about what I did, saw, and ate in Xinaliq, and how you can do the same should you find yourself in Azerbaijan one day. Xinaliq, often known as Khinalug, is the highest altitude mountain town in Azerbaijan, and one of the highest in Europe. 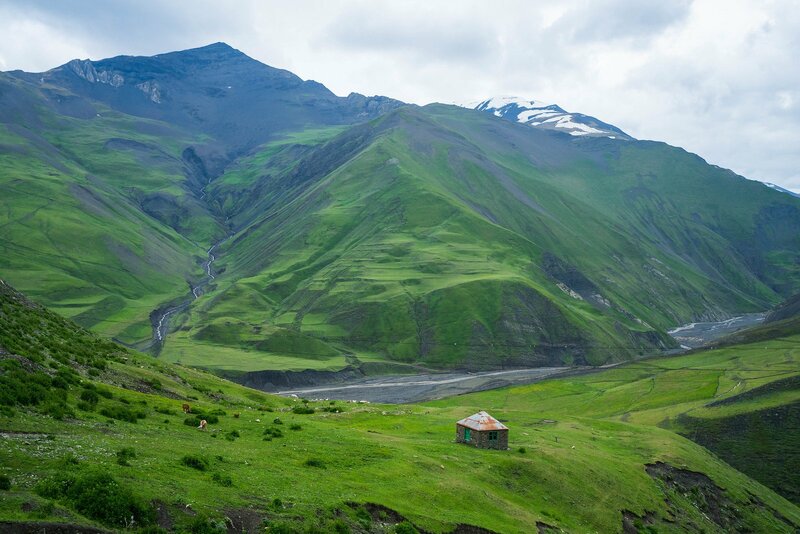 Situated at about 7,700 feet (2,600 meters) in the Caucasus mountains, this village is currently home to ~2,000 people, mainly farming and ranching families who grow crops and livestock for a living. Needless to say, Xinaliq is a pretty special place. I was so excited when I found out I could travel to Xinaliq on a tour that I jumped at the chance. A day trip to Xinaliq, despite being somewhat short, offered me spectacular views and a tiny glimpse into what life is like in this magical, remote area of Azerbaijan. Bright and early, my guide, Eldar and my driver, Namiq, picked me up from my hostel in Baku. There were three of us on the day tour – I’d joined forces with a couple from Barcelona to help reduce the costs. Once we picked them up and stopped for snacks and water, we were on our way. On the way to Xinaliq, we stopped in a small city called Quba. Despite the fact that many places were closed when we arrived, some notable things to do in Quba include visits to Quba’s carpet weaving shops and the famed Jewish Quarter. After our stop in Quba, the terrain started drastically changing. The road began to turn from perfect pavement to gravel, and then to straight mud. Houses became more and more sparse and the terrain became more rocky as we wound through forest roads that let out at a giant gorge. As the roads got worse, the scenery got better. The road eventually steepened and led us up to some absolutely breathtaking views of the valley below. In the van, our driver played some traditional Azerbaijani music and a few recordings of love poems he had written in the past. I’m always reminded, when I listen to new music or languages, of just how much sounds can say about a place. During the van ride there, I loved wrapping my head around the sounds of Azerbaijan’s music as I leaned my head against the window. Finally, after about 4 hours of driving, we arrived in Xinaliq. The roads here were steep, rocky, and bumpy, and I was worried our van wouldn’t make it up the hills. Alas, we were fine, and I stepped out into the cool mountain air, taking a deep breath and admiring the village around me. Our first stop in Xinaliq was at a local family’s home. A typical home for the area, the exterior was made of stone/mud and the inside was paneled with wood. From where? I wasn’t sure. We met our host, Zaur, who was a middle-aged man with a friendly face, dark hair, and deep smile lines. He showed us to his dining room, which had a small window that had lovely panoramas of the valley below. Lunch with a view? Don’t mind if I do. Our lunch was a meal full of local staples such as lamb, potatoes, yogurt drink with local greens, and herbal tea. All of the ingredients were fresh from the local farmers’ products. It’s so amazing – and somewhat rare as a US traveler – to see meals that are completely sourced locally. During lunch, a slightly uneasy feeling crept up over me. As I walked around the town to gawking stares from locals, I wasn’t sure about how to feel as a tourist in this remote town. My own curiosity had brought me here, but was it actually okay for me to visit? Was I inadvertently intruding on a community that’s better off without hordes of Western tourists running around? My fears were somewhat quelled when, after lunch, Zaur proudly brought over his wide variety of postcards from around the world, sent to him by former guests in Xinaliq. He displayed each one with a huge grin – cards from China to Washington, DC, Dubai to London. The locals here, it seems, enjoy making connections and friendships with the rest of the world just like we do. Speaking of making friends… it was really easy to meet people in Xinaliq because we stuck out like a sore thumb. Here, everyone in the community knows each other, so even if we weren’t traveling in a big van wearing brightly colored raincoats, they’d still know we were outsiders. As tourism isn’t quite developed yet in Xinaliq, local kids are especially curious about the small groups of foreigners wandering their streets. While we were walking around the town, we noticed a group of schoolchildren following us. Every time we’d stop to look at them, they’d giggle and smile, whispering to each other mischievously. Finally we stopped to talk to them. Of course, neither of our groups could understand what the other was saying, but it was fun to simply try and communicate and laugh with them. Our guide helped to translate a bit, but for the rest of the time we were there, the kids followed us around, occasionally stopping to play in the street or skip rocks in one of the mud puddles. There are loads of hiking trails and paths around the town and up to the top. We just wandered aimlessly around some of the main town areas, down to the bottom where there were sweeping views of the green, treeless mountains that surrounded us. With plenty of opportunities for day hikes, Xinaliq is a nature lover’s paradise. In seeing some other photos of this same tour, there’s also an opportunity to walk up a path to the top of Xinaliq, where there are views of the village below. Outside of the village there are also several trails, but be sure to ask locals for recommendations as a few of them lead into the Russian border area or are off limits for tourists. Because it’s such a heavy agricultural community, Xinaliq offers tourists the opportunity to participate in horse riding and other animal- and farming-related activites. I’d only recommend doing this if you’re extra daring or are skilled with equestrian activities (I wasn’t either of those things). When we were driving into Xinaliq, I noticed that there were a few roadside picnic areas with small cabins nearby. Our guide told us that these are actually restaurants and tea houses that are popular with domestic tourists from Baku and Quba on the weekends and during the summer. On the way back to Baku, we stopped at one located in the middle of a jagged gorge for a cup of tea and some local baklava. The tea was good, the baklava was almost too sickeningly sweet, but what I did love was hearing the sounds of the river rushing nearby and the wind rustling through the trees. There’s nothing like the feeling of cool air on my face towards the end of a long day. Stopping for tea on the way back provided a much-needed break from the van in an amazingly tranquil location. One of my favorite things about this day trip was getting the chance to see some of Azerbaijan’s most jaw-dropping landscapes. Deep canyons, raging rivers, green forests, and rocky mountaintops dot the landscape here, and although there are a few houses here and there, it feels much more natural and raw than the concrete mazes of the cities. If you’re wanting to go somewhere simply to enjoy nature and see something beautiful, Xinaliq and the ride there definitely afford that opportunity. I couldn’t believe my eyes at some points, when we’d see a herd of sheep walking through a green valley or a steep cliff overlooking a marvelous valley. Xinaliq is undoubtedly one of the most picturesque places to visit in Azerbaijan. Getting to Xinaliq in the first place is a challenge in itself. First of all, it’s a 3.5+ hour journey from Baku, which isn’t easy considering the roads are pretty bad after you pass Quba. Second, you need a certain type of vehicle to drive on the road to Xinaliq, as it’s extremely muddy and steep. It’s pretty terrifying. Basically, what I’m trying to say is a) you should NOT attempt to drive it yourself and b) there are only two other ways to get to Xinaliq. There are only a few tour operators from Baku who offer day tours to Xinaliq, but they do exist in growing numbers. Typically, these tours to Xinaliq last about 12 hours and are paired with a stop in Quba’s Jewish Quarter to view some local synagogues as well. Theoretically, tours run every day, but they actually only run on demand and prices vary based on the number of people who are signed up. Because of this, prices range from $50 a person for 6+ people on the tour to over $150 for 1 person (essentially a private tour). Note that because the tour prices vary depending on how many people are signed up, you may not know how much your tour is until the day of. For solo travelers especially, trying to find a tour within your price range might be tricky. If you’ve decided you want to go to Xinaliq on a day tour, I recommend contacting both of the two companies below to check prices and available tour dates before you commit. The tour company I went with was Azerbaijan Traveller and I had a wonderful experience. My tour included lunch, snacks, and tea, plus all transportation in a spacious van. We also had a guide, Eldar, and a driver, Namiq, who were hilarious, kind, and courteous. I highly recommend checking Azerbaijan Traveller reviews on TripAdvisor (they’re the ones who run the free walking tours of Baku as well). To inquire about prices and/or book a trip with Azerbaijan Traveller, visit their website or email them at enquiry@azerbaijantraveller.com. Alternatively, the other company that runs frequent tours to Xinaliq that came highly recommended by fellow travelers was TES Tour. They’re popular because they run daily Baku area tours to sights like the mud volcanoes and Gobustan National Park. Since I can’t provide a full recommendation about TES Tour’s trip to Xinaliq, I recommend checking TES Tour reviews on TripAdvisor so you know what to expect. To inquire about trip prices and book a tour, you can contact TES Tour on their website or at info@testour.az. The second option to get to Xinaliq offers more flexibility but is also considerably more expensive. It requires a combination of public transit and private or shared taxis (or hitchhiking, but I really can’t recommend that). To get to Xinaliq from Baku, you first need to take a public bus to Quba. The buses leave frequently from Baku’s central station and take 2-3 hours to arrive. The cost is ~4 AZN. From Quba, you can hire a private taxi for ~$40 USD to get to Xinaliq one-way (according to many disparate sources), or negotiate a full day trip from Quba. There’s also the option for a shared taxi, but this is only available if there are multiple people wanting to travel to Xinaliq from Quba and prices are set by the driver. Needless to say, this can be a difficult option as many drivers in Quba will only go to Xinaliq in the mornings or early afternoon, meaning you’ll possibly need to spend the night in Xinaliq if you decide to get a one-way taxi. I did not choose this option (obviously), so I can’t speak to exactly how easy or difficult it is. However, I know that the timing and logistics can be very difficult, and it might not be all that cheap. If you do decide to take option #2, there are several locally-run homestays in Xinaliq that offer rooms for travelers. Some people opt to stay a night in the village and spend a bit more time hiking. This is easiest if you’ve chosen transportation option #2 and organized a return ride with your taxi driver in advance. The process for booking these is very informal and word-of-mouth. From what I’ve heard and read online, most people simply show up in Xinaliq and ask around for homestays, negotiating and settling on a price with a local family that includes full board (there are no formal restaurants in the town). In the local home where I ate lunch during my day trip, there was an extra room where travelers could spend the night, so I can confirm that these informal guest houses do exist. You can also search and book guesthouses in Xinaliq on Booking.com, but as I did not have any cell service in Xinaliq while I was there, I’m not convinced this is a reliable way to reserve a room.